I still work with "Art Formats" ( "Format Art " ) activating them as globally as possible but also creating new ones . The first Manifeste is from 1989 . The aim of " Art Formats " is to activate critical plattforms globally as response to a world with emergencies . Emergencies have to be treated " in time before it is too late ". Some of the most known Art Formats are : "Emergency Room" , "Critical Run " , "Biennalist " ," Debate Rave " . This format is for professional artists to express about Emergencies . Now before it is too late . Artists are thermometers and we must know what they think about today , today before it is too late . In Emergency Room artists can point at dysfunctions in real time meanwhile their expression can have an impact . In Emergency Room the exhibition changes daily . Emergency Room is a special room builded as part of the format . The Emergency Room artists come when they are burning . . Emergency Room is the central structure for all awareness muscle formats listed below . Critical Run is also an Art Format : Here particants are running while debatting . Critical run have been activated in London / Moscow/ Rotterdam / Siberia / Barcelona / Bruxelles / Paris / Napoli / Hanoi / Sydney etc ... . In this Art Format others than professionel artists can participate in the running debate . Run debate are filmed and then exhibited . Subjects like "apathy ", "the role of the artist ", " emergencies " , "gentrification " are examples that have been run-debated . Coming at Venice Biennale and Documenta . This format can be ( and has been ) activated the same day in different part of the world . Biennalist is an Art Format commenting on Biennales and other cultural managed events while they happen . Often biennales promote themselves with thematics . Biennalist take those thematics very seriously , and explore them on location. Sometimes Biennalist collabore with Emergency Room artists to provide a burning content that cannot wait ( today is today , today before it is too late ) . Biennalist often activate the Penetration format , the Critical Run format as well as Rumeur art format . 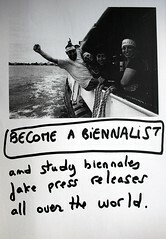 There is not a good Biennale without Biennalist". Penetration is also part of the Art Format group .A Penetration is an artist's act of placing an artwork within another artist's already existing exhibition ,with his permission . 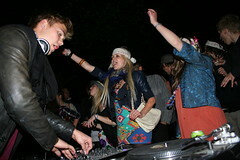 The Protest Fashion THE ART FORMAT : "DEBATE RAV "
It concern mostly young people going to festival and parties . Exhibiting opinions and debating is encouraged to train and grow the Awareness Muscle . The Protest fashion is also turn toward emergencies. It was launched at the Roskilde festival for the first time connected with flash mobs and marchs as well than activities on camp. then in documenta magazine 2007 with Kunst.EE . Important topics are shared while slow dancing . No more loneliness i front of the medias . Wikipedia , Facebook, Google and Myspace as spaces.